Wow. Blogging is real work! It’s more than I thought it was and I’m excited about how much I’m learning about the back-office in blog-world. LUCKILY, I have 3 semi-feral kittens in the guestroom happily learning to socialize with a blog deficient human. ‘Happily learning’ is my interpetation of 3 hungry kittens looking up at me to see what’s for dinner. They’ve learned to hop down to their plates under the table and happily eat regular meals. Nah. 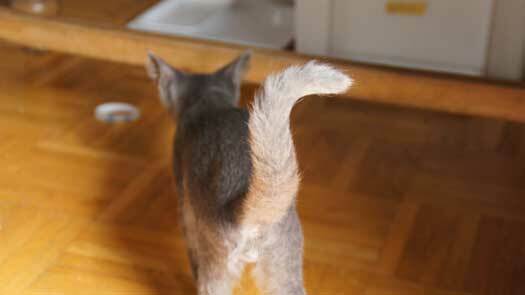 Nothing beats a friendly high-tail salute from a kitten born outdoors learning to live with people. The trust slowly instilled is priceless after days of friendship building techniques. Do not stare at cats square in the face. If you do and they’re glaring back at you, they are responding to your ‘aggression’. Don’t try to touch them the first day. Day 3 – 5 is the best to start handling unsocialized kittens (with or without heavy leather gloves). This is after they’ve acclimated to human indoor living, ie. a room with a door, litterbox, etc. *Do contact your local cat rescue association for expert help!